We can remove snakes from your Yard or Home anywhere in Florida! The Florida cottonmouth or green-tailed moccasin, is a venomous pitviper found in the southeastern United States, and Florida in particular. Most people dread snakes – any sign of them can send people into a panic. The vast majority of snakes we deal with are non-venomous, however care must be taken during the occasional encounter with a venomous snake. The most common indicator that someone has a snake problem is after a visual encounter; however shed skin can also be an indicator. Certain species will often enter the attic or crawlspace of someone who is experiencing a rodent problem taking advantage of your misfortune. Snakes and rats go hand in hand. If you fall into the category, like most in Florida, of not knowing a venomous snake from a non-venomous snake, it’s best to call an expert to take care of the problem. All snakes in the Florida ecosystem have their place; however, that place may not be in your garage or in your home. We can help you identify different snakes in Florida from the common snakes you’ll see in your yard like a black racers, garden snakes, grass snakes or a yellow rat snake. We can also help you determine the differences between a coral snake and a scarlet king snake. We can come in and remove any problem wildlife, venomous or non-venomous, we have the proper snake catching tools and traps to get the job done safely and correct the first time. Recent news reports have educated people to the dangers of pet constrictors (Boa constrictors, Burmese pythons) escaping or being released into the wilds of Florida. Along with Central Florida’s venomous species, this should be a concern for the safety of your children and pets. 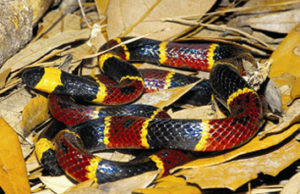 This iconic snake, with its bulbous head and red, yellow, and black bands, is famous as much for its potent venom as for the many rhymes—”Red and yellow, kill a fellow; red and black, friend of Jack”—penned to distinguish it from similarly patterned, nonvenomous copycats, such as the scarlet king snake. Coral snakes are extremely reclusive and generally bite humans only when handled or stepped on. They must literally chew on their victim to inject their venom fully, so most bites to humans don’t result in death. In fact, no deaths from coral snake bites have been reported in the U.S. since an antivenin was released in 1967. Eastern coral snakes are relatives of the cobra, mamba, and sea snake. They live in the wooded, sandy, and marshy areas of the southeastern United States, and spend most of their lives burrowed underground or in leaf piles. They eat lizards, frogs, and smaller snakes, including other coral snakes. Baby snakes emerge from their eggs 7 inches (17.8 centimeters) long and fully venomous. Adults reach about 2 feet (0.6 meters) in length. Average lifespan in the wild is unknown, but they can live up to seven years in captivity. In the eastern range of the United States, venomous copperheads are commonplace in the spring, summer and fall. The broad-banded species – like this snake, pictured – have dark, reddish brown cross bands that wrap around its body, a triangular-shaped head, heavy body, and tail tips with a grayish-green or even turquoise hue. As pit vipers, copperheads have small holes (called loreal pits) on their heads. These special sensors detect the body heat of other animals. Copperheads are generally opportunistic hunters, patiently waiting for the perfect moment to ambush prey like lizards, frogs and birds, but they will also forage for quarry. Young copperheads have brightly-colored tail tips, which they wiggle like a caterpillar to lure prey into their strike zone. These pit vipers then swallow prey whole and head-first, even while they wiggle with life. Although copperheads are active hunters in their range, they have their own share of predators to worry about, including king snakes, milk snakes, racers, hawks, opossums.While copperheads are sometimes found living near human settlements, bites are rare, usually occurring due to improper handling or accidental contact. These pit vipers prefer to escape than strike, but will bite if cornered or threatened. Symptoms from a copperhead bite can include swelling, weakness, vomiting and breathing difficulty. The water moccasin, North America’s only venomous water snake, has a distinctive blocky, triangular head; a thick body; and a dangerous bite. Water moccasins rarely bite humans, however, and only attack when threatened. They are semiaquatic, so they’re happy both swimming in water and basking on land in their native range in the southeastern United States. Both “water moccasin” and “cottonmouth” are common names for Agkistrodon piscivorus. The name ‘cottonmouth’ comes from the white coloration of the inside of the snake’s mouth. Water moccasins are pit vipers, like copperheads and rattlesnakes. “Like all pit vipers, [they] have heat-sensing facial pits between their eyes and nostrils,” Viernum said. These pits are able to detect minute differences in temperatures so that the snake can accurately strike the source of heat, which is often potential prey. Water moccasins’ venom is potent. “Cottonmouth venom is composed mainly of hemotoxins that break down blood cells, preventing the blood from clotting or coagulating,” Viernum said. The results can be serious or even deadly, though Viernum and other experts emphasize that fatalities are very rare. Viernum further described the effects of the bite, saying that the hemotoxins lead to “hemorrhaging throughout the circulatory system wherever the venom has spread,” she said. “Envenomation from a cottonmouth can lead to temporary and/or permanent tissue and muscle damage; loss of an extremity, depending on the location of the bite; internal bleeding; and extreme pain around the injection area,” Viernum added. Anyone suffering from a water-moccasin bite should seek medical attention immediately. Antivenin is available. The Dusky Pigmy Rattlesnake is the most common venomous snake in Florida, and is responsible for more human snakebites than any other snake. It is found throughout the state. Also known as the ground rattler, the snake is grey in color with black blotches all over its body, including the underside. There is a series of nearly circular black markings on the middle of the back, with a dotted brick-red to orange line running right down the center of the back, between each black blotch. These snakes only attain a length of 2½ feet, but average around a foot in length. Their small size and moderately mild venom keeps them from being a serious threat to human life, but the bite is still extremely painful. Despite their diminutive size, every Dusky you meet or have yet to meet will act like it was 12 feet long and ready to take on anything. If you give the snake half of an opportunity to bite you, it will happen. Don’t count on hearing the rattle, as it is very slender and does not produce much noise. They are active both day and night. Their diet includes lizards, amphibians, and rodents. In most areas, they prey upon the first two items, which being lower in protein than rodents, is probably the reason most do not exceed 18 inches in length. In a captive situation, or where in residence in an agricultural area where rodents are readily available, they will grow bigger. The Eastern Diamondback Rattlesnake is the largest rattlesnake in the world. It is, therefore, at least potentially, one of the most dangerous animals in North America. While averaging 3 to 6 feet, they have been known to hit 8 feet even. Stories of rattlesnakes, both from here in Florida, and in Texas, of much greater length are extremely difficult to substantiate. Diamondbacks do have a proclivity toward shrinking as they get closer to a tape measure. Eyewitness accounts and length estimates are often very inaccurate, probably due to the amount of adrenaline involved. If you should hear a rattlesnake, freeze, then determine exactly where the sound emanates from, then draw a mental line from that point, through your body, turn around and follow that line. The animal is letting you know that it is there, frightened or angry, and if you continue to press the issue, you could well wind up with more than you bargained for. Left unmolested, the animal will not bite, and will eventually crawl off to a less crowded area. The diamondback in Florida is born between August and November, which is also the breeding season. At birth, it is from 11″ to 16″ in length, and possesses enough venom to delivera lethal bite to a grown man. Young remain as a group for several days after birth, and have been known to be protected vigorously by the mother.Their prey, strictly warm-blooded animals, is located with the aid of heat sensitive facial pits. Prey includes mice and young rats for the juveniles, then larger rats, ground dwelling birds, and rabbits. They have also been known to actively hunt squirrels by waiting at the base of a tree, looking up. These snakes are primarily diurnal (active during the day) or crepuscular (active at dawn or dusk), and are seldom active at night. Diamondbacks are found in high, dry areas. Three types of prime habitat are slash pine/palmetto, longleaf pine/turkey oak, and sand pine/rosemary scrub. The presence of gopher tortoises(Gopherus polyphemus) in the area makes the habitat more likely to support diamondbacks, as they utilize the tortoise burrows as sanctuaries.The number of segments in the rattle do not determine the snake’s age, as one segment is added at each shedding of the skin, which can vary from once or twice up to a half dozen times per year. Also, the rattle consists of a very thin material that is readily broken. A wet rattle will not make noise. A rattle of about 2 inches in length will make more noise than one that is considerably shorter or longer. The eastern diamondback rattlesnake does not live in close proximity to man for extended periods of time. When an area is cleared for construction, the animals either leave or are slain. Bearing this in mind, the next time you see one of these impressive, nearly awe inspiring snakes, ask yourself whether it is in your back yard, or if you are in its. If it is indeed you who are the trespasser, there’s no real need to kill that critter. They do help to keep rodents and rabbits in check, and they are seldom a real danger to people. The more proper name for the Canebrake Rattlesnake, now, is the Timber Rattlesnake. This beautiful snake is found in the northernmost portion of Florida, within about 75 miles of the Georgia line, across the entire width of the state. This is a large rattlesnake, up to 6 feet, averaging around 4 feet. Ground color is from pale grayish brown to pinkish buff. The pattern consists of dark brown to black V-shaped cross bands, with a russet stripe down the centerline of the back. They also have a broad, dark stripe angling back from the eye. The tail is a velvety black. Venom toxicity varies greatly not only from species to species, but from populations within the same species as well. Canebrake rattlesnakes in this state have the potential to have an even more virulent venom than the eastern diamondback’s, and should, therefore, be treated with the utmost of caution and respect. Their habitat includes lowland areas such as edges of marshes and swamps, where they prey primarily on rodents.If you are experiencing problems with snakes around your home or business, we can help. Florida ACM will safely remove any snake from your home and property.Many people refer to the dangerous serpents as “poisonous snakes”. There’s no such thing as a poisonous snake. The term itself is not correct – any snake possessing toxicity is in actuality a “Venomous” snake. Venom is injected, poison is ingested. The term is properly applied depending on the animal’s (or plant’s) mode of introducing it’s toxin into something else’s system. Venomous is when the toxin is injected into something else, be it a bite or a sting. Poisonous is when the toxin is eaten or absorbed through the skin. Snakes can be venomous, as can scorpions, spiders, many fish and even bees (that’s why the sting hurts so much!). But no snake is poisonous, -you can eat a snake (although I don’t advise it) without getting envenomated. Things that are poisonous include many amphibians, a large number of plants. Different snake control products like moth balls, snake repelants, snake pesticide or reptile repelants are a waste of time. Contracting a professional snake exterminator to come in and set up a snake removal plan, which can include trapping and removing and an extensive search of the property and buildings. Do not try to be your own snake catcher, with the amout of invasive species we have here in Florida snake control is something best left to the experts. Weither you have snakes in your house or just need snake removal from your garden. Do not waste your money and time with snake repellant plants or snake sticks, snake repellant spray and things like snake away are not how you get rid of snakes. Watching a few snake catching videos will not make you the next Steve Irwin or Jack Hanna, snake bites are painful and expensive. Make a note of the snakes location and contact Florida ACM immediately and we’ll come to you and humanely remove the snake from your house or place of business. Call our Emergency Animal Hotline at (386) 235-2175 and we’ll make a priority call to take care of your snake problem.